This blog is dedicated to the restoration and preservation of the little known but significant contribution of the West Indians in the culture and history of the Republic of Panama. The Living Cultural Treasures of the Silver People. THE SILVER PEOPLE CHRONICLE: Al maestro con cariño. It is sad how the most negative patterns of racial injustice tend to repeat themselves. I’m referring to the case of the Haitians in the Dominican Republic and how their plight is echoing the same exact situation of the Panamanians of West Indian descent back in 1941. After an unappealable decision by the Constitutional Court of the Dominican Republic in September of this year, the future of particularly the Dominican born Haitian descendents is suddenly uncertain as they will become “stateless,” a status no better than slavery. 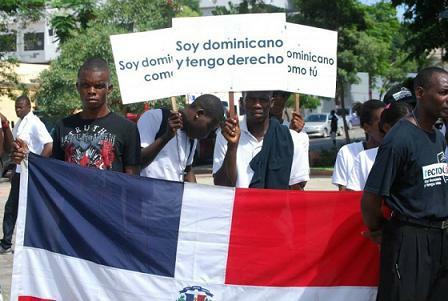 The 10 million people who populate the Dominican Republic includes about 458,000 people of Haitian descent, many of whom are undocumented or are poorly documented according to census figures. About 240,000 of those people of Haitian descent were born in the Dominican Republic thus, by all rights, should possess a Dominican birth certificate, hence citizenship. Human rights groups say the ruling could leave Haitians in the Dominican Republic without basic rights such as the right to vote and their children’s’ right to a birth certificate, and would restrict their access to basic services such as public education and public health facilities. It is painful and stirs any advocate for human rights to follow the unfolding of these events with keen interest, keeping in mind how more than 70 years ago the same scenario was played out in the Republic of Panama with regards to the people categorized as “Prohibited Immigrants,” the bulk of which were made up of black West Indians and the children born to them in Panama. For those of our readers who have not yet read our articles relating to this dark period of the history of the Silver People, included in the category of “Prohibited Immigrants” were also the Chinese, Hindus, Turks etc., but the black West Indians, being the most vulnerable, had become the political targets for Panama’s political elites. Speaking for the Administration, (the Panamanian) Foreign Secretary de Roux (1940) categorically denied that the “Prohibited Immigrant” clauses were inspired by racial antagonism, but that these persons had “proven” that they were in-assimilable, and that the persons of this “restricted groups” – that is, non-Spanish speaking “Negroes, Hindus, Chinese, and natives of Asia Minor and North Africa, were not of the stock which was desired to make up the national entity…and that Panama had the undisputed right to choose the racial stock in the new impulse which is being given to national unity. In Panama, following the passage of the 1941 Constitution, many West Indian families were left stateless and without basic rights. The parents of children born in Panama often scrapped plans to send their children to public school and, instead, opted to send their kids to their own, private “English Schools.” Those who lived those times still remember that West Indians generally lived in constant fear of being rounded up for deportation. The “nationalization of commerce” clauses also had pernicious effects on the hundreds of businesses and schools owned and run by West Indians. As an example, the coconut exporters based out of Colon were practically wiped out in one fell swoop as a result of the measures attached to this code. There was, in fact, an exorbitant (mandatory) deposit of US$15,000 required of the businesses owned by these “undesirable citizens.” Many of the English Schools were also adversely affected by these new and unreasonable rulings as many of them had to close their doors for the inability to come up with this sum of money. “Probably its greatest evil was to further worsen relations between the immigrants and the rest of Panamanian society.” I see this paralleled in Dominican society as well; a society which has, historically been extremely racially stratified with the dark-skinned blacks at the very bottom of the social ladder. Ten months after the 1941 constitution was passed, its author and proponent, President Arnulfo Arias Madrid was deposed by the National Guard and, although the government of Ricardo A. De la Guardia did not enforce the new immigration restrictions, his government did very little to stem the tide of rising racial discrimination and accentuated the restrictive measures based on race, color and language. Panama’s 1946 Constitution supplanted the notorious 1941 Constitution but the restrictions on the black children of West Indian descent remained in tact – Article I paragraph 9b. It would take the vigorous efforts of two men, Pedro Rhodes, a lawyer from Colon, and George W. Westerman, a journalist, to bring these human rights violations to the attention of the United Nations and to the Panamanian Assembly. You can follow our articles here, here and here. The Dominican government’s decision regarding the Haitians will have deleterious effects on the fate of thousands of citizens in their own country, including families that are a blend of both Haitian and purely Dominican descent the which there are many. Just like Panama’s 1941 Constitution, it will send many people into a negative demographic movement mostly towards the U.S., Puerto Rico, etc., and underground in the Dominican Republic. It will break families apart, set the stage for cruel immigration roundups, as if being black and of Haitian descent, is a crime. It will also add to the general human rights miasma that seems to have re-generated in today’s societies, especially those claiming to be democracies. I hope that my comparison of the two human rights struggles both in Panama and the Dominican Republic has triggered enough outrage and sensibility in our readers to readjust worldwide attitudes toward people of African Descent, especially Haitians. The people of Haiti were the first people to struggle against slavery in the Americas and to fight for their independence. We are uniquely indebted to them as many of our American States- Central and South- were aided both financially and ideologically by this tiny little nation in the Caribbean. We must remember how Simon Bolivar received large loans from the government of Toussaint Louverture on condition that Bolivar fight against slavery in the new republics. I’ve signed this petition. Go ahead and show your support. This entry was posted in Black Studies, Silver People and tagged 1941 Constitution of Panama, Haiti, prohibited-immigrant-laws-in-Panama, racial-identity. Bookmark the permalink. Keep up with the Silver People Law!! Get all of our articles here. All are invited. All are welcome to come. Check out our other pages here. Just type in key words here.